In case you missed my projects for this Christmas....SANTA SLEIGH...here's it is again for you. Once again I used product from my stash to complete the SANTA SLEIGH! Left over embellishments from my last Fiskars Demonstration....some tinsel from my xmas box and even SANTA has been in our Xmas Box for quite a few years.....so now he gets his own sleigh with Rudolph in the Lead.....LOL! WOW ....what a great day I have had today Judging the Scrapbooking Sections at this year's Whittlesea Show so I wanted to share some of my day with you all. Once again I was welcomed and given my table with two Stewards.....we had a great day......lovely luncheon was provided to all Judges.....and I got to catch up with Louise Robinson Life Member of the Royal Melbourne Show...who was there to judge the Special Needs Sections. I was told after I had finished Judging the Scrapbooking Sections that some of the people in a few of the layouts had died in the Bushfires and a family member had scrapped these layouts ....such an emotional thing to do but also great therapy to use a craft in this way......recording family memories....after all Scrapbooking is about preserving memories and telling the stories for generations to come.......but I do understand how hard this can be after losing someone! ....and last but not least these gorgeous little Felt Booties that Vivien created.....isn't she Multi-talented! I'm always amazed at how creative crafters can be and I always get soooooooo inspired after attending a Show......love seeing such a variety of crafts all in one Pavilion. Why not create a fun Card Holder to hold this year's Christmas Cards!! I sure had fun embellishing and altering this Card Holder from Kaisercraft......I just love their OTP products....and of course also used some of their Christmas Range of papers as well. 1.I painted the trunk,baubles and the sides of the tree with some gold and green paint from my stash. 2. Used my Fiskars Personal Trimmer to cut the paper...I left some gaps as I arranged paper on tree. 3. Adhered the paper to the tree base and left to dry for about half an hour. 4. Trimmed along the edges of paper with my Fiskars Fingertip Control Knife. 5. I did both sides of the tree.Finished one side ...then repeated the process. 6. Decorated the baubles with some Kaisercraft pearls and Bling. 7. Adhered the bottom half of the baubles only to the tree....just spaced them out. 8. Next added some butterfly and holly embellishments I purchased from Spotlight VIP Night. 9.Added some cards that we have already received this year. If you have missed some of the Card a Day shares that have been on here this month...then don't worry....you can just click on the link below this post and it shall take you to all the Cards that have been shared.......click on the Christmas link below here.....and it shall take you to some Christmas projects....we hope that we are inspiring you to create something handmade this Christmas! I have used a Kaisercraft Wooden BABY word . I painted all the letters first.....and sanded the edges. Added some Ink by Steph Pattern Paper on two letters and trimmed around with my Fiskars Fingertip Control Knife...then sanded off around the edges. Next I added some flowers and brads....and the cute little metal BABY FEET I got from "Scrapsadaisy"....adhered using "sticky dots"...I love these little things...use them all the time! Just had to wind some thin blue ribbon around the "B" and some ribbon around the "A"
Also added some 3 -D embellishments from my stash......Cloud 9 Finley's Estate. So this is my first BABY project for my first grandchild........I'll be giving this to Brendan and Sally just before the BABY is born......so that it can hang on the wall in the Baby's room! I have another few BABY projects on the go......so will share those also when I've finished them. Hello everyone in blog land. I've been a bit quiet here haven't I. Well I've been hanging out with Tim Holtz! Oh ok you got me.... not with the "man" himself but his blog. At the moment he is having is infamous "12 tags of Christmas." Its so much fun and I'm learning heaps! "Keep your mind open - you may learn a thing or two." All tags were made with the tag template and the Ultra Shape express from Fiskars. The snow tag was stamped with Cloud 9 - Christmas Is... - clear stamps - snowflakes and the Fiskars clear stamps - 'tis the season - snowman of course with Fiskars stamp press. 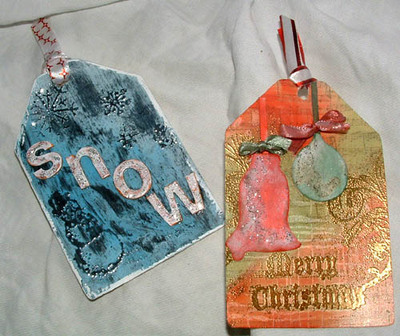 The Merry Christmas tag was made using the Christmas-2 Template (bell and bauble) and the "Merry Christmas" is from the Fiskars Clear stamps - 'tis the season. OOOH must not forget the white and red ribbon is from Li'l Davis - Rockstar Ribbon Ruby. Joy tag: the JOY letters are from Christmas Joy kit from Cloud 9 and decorated with kindy glitz. The stamped images - holly leaves (enhanced with pen), bells (enhanced with kindy glitz), Noel word and people are all done with Fiskars clear stamps - 'tis the season. Snowman tag: Snow man was made by using the round tag from the Tag template and the Ultra shape express(USE) from fiskars. The USE was used freehand to cut out the hat, eyes, twig arms holly leaves, carrot nose. The Holly Berries are red raindots from Cloud 9 and the snow flakes are done with cloud9 - Christmas is... clear stamps. Ribbon is Lil Davis rockstar ribbon ruby. The chipboard letters were from Heidi Grace - Day Dream believer... I ripped the patterned part off the chipboard letters and inked them up. So have I got you interested? 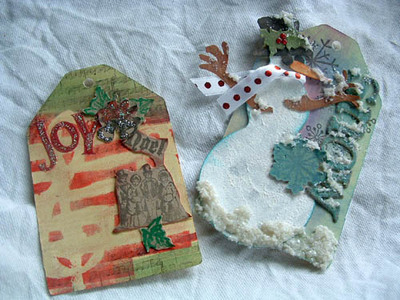 Go to Tim Holtz blog and join us in the 12 tags of Christmas...... tomorrow is day 9.
i hope you have time to enjoy your creativity this Christmas.